Parking in the City of Placerville includes one free 2 hour parking stint per day. Moving your vehicle to another location after your 2 hours of free parking is up does not start the free 2 hours over again. Also the 2 free hours cannot be broken up throughout the day. The free 2 hours does not stop and start through out the day as you come and go. Once the 2 hours starts it runs its course and any further time needed will have to be purchased. Enforcement: 8:00AM to 6:00PM, Monday - Saturday (except Major Holidays) Holiday Schedule 2019 . On-Street Parking: 2 hour free parking only, if you need to park longer than the 2 hours you must move your car to one of the City parking lots that has a parking meter. Parking on the street longer than 2 hours will result in a citation. Town Hall Parking Lot: 2 free hours parking only, if you need to park longer than the 2 hours you must move your car to one of the City parking lots that has a parking meter. Parking in the Town Hall Parking Lot longer than 2 hours will result in a citation. Center Street Parking Lot: The small parking lot located on Center Street across from City Hall, is a combination of permit parking and two-hour free parking which cannot be extended. If you do not have a permit for this parking lot and you are in the Center Street Parking Lot staying for longer than 2 hours will result in a citation. All Other Parking Facilities: All other parking facilities, including the Center Street parking structure, are 2 hour free parking. Parking in excess of 2 hours is to be paid for at the rate of $2.00 per hour, starting April 1, 2017, with a maximum cost of $18.00 per day. Pay Stations: Pay stations are located on each end of the first and second floors of the parking structure and in each of the parking lots, with the exception of the Town Hall and Small Center Street lots, which are 2 hour only free parking. Pay stations accept both cash and credit cards, and purchaser simply enters their license number without having to return to vehicle. Purchasers may add additional parking time by using any pay station in any City lot or on WAYTOPARK. For instruction on how to work the parking meters please click here . Permit-Leased: Starting April 1, 2017, parking permits cost $50.00 per month. Permit holders for the Mooney and Ivy House lots may park in any available space within their designated lots. Permit holders for other lots are assigned to a particular space in their respective parking lot. In the Center Street parking structure, the 3rd floor is designated permit parking only. There is no permit parking in the Town Hall parking lot. Permit spaces may be shared by individuals utilizing that space at different times. In that instance, additional parking tags will be provided. Also, a limited number of premium permit spaces are available on the 2nd floor of the Center Street Parking structure. The rate for these spaces is $70.00 per month. While the original number of permits have been reserved as of this time, permits for the 2nd floor of the parking structure are available. These spaces are assigned on a first-come first serve basis. For inquiries regarding permit parking, call (530) 642-5200. Free All Day Parking At Mosquito Park And Ride: A free parking facility is located on Mosquito Road. El Dorado Transit provides a bus from Mosquito Road to Old City Hall every hour from 6:04 AM to 6:04 PM and from Old City Hall to Mosquito Road every hour from 6:36 AM to 6:36 PM Monday through Friday. On Saturday, the bus from Mosquito Road to Old City Hall runs every hour from 9:30 AM to 4:30 PM and from Old City Hall to Mosquito Road every hour from 9:22 AM to 4:22 PM The bus is $1.50 for general passengers and $0.75 for discount passengers with eligibility identification. For more information please visit http://www.eldoradotransit.com . You may also walk, which is approximately a half mile to the main hub of Main Street. Attached is a map showing the walking route walking map . Jurors - Free Parking and Free Bus: A free parking facility is located on Mosquito Road, and jurors who show their jury summons ride the bus for free to and from the courthouse on the days of their service. El Dorado Transit provides a bus from Mosquito Road to Old City Hall every hour from 7:04 AM to 6:04 PM and from Old City Hall to Mosquito Road every hour from 7:36 AM to 6:36 PM Monday through Friday. For more information, please visit http://eldoradotransit.com/juror-transportation/ . Enforcement: 8:00AM to 6:00PM, Monday - Saturday (Major Holidays excepted). Pay By Mail : Payment must be made by Money Order or Check, make check out to City of Placerville . Write your Ticket Number and Plate Number on the front of your payment. 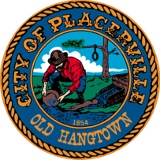 By Phone: To request a review of your denied appeal or for further information call the City of Placerville at (530) 642-5200, Monday- Friday 8:00 am to 5:00 pm.